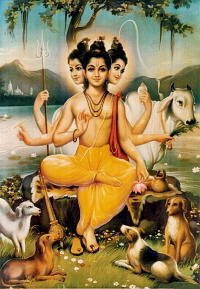 Dattatreya is a Hindu God who is an incarnation of the Divine Trinity Brahma, Vishnu and Shiva. The word Datta means “Given”, Datta is called so because the divine trinity have “given” themselves in the form of a son to the sage couple Atri and Anasuya. He is the son of Atri, hence the name “Atreya”. In the Natha tradition, Dattatreya is recognized as an Avatar or incarnation of the Lord Shiva and as the Adi-Guru (First Teacher) of the Adi-Nath sampradaya of the Nathas. The creative, the preservative and the disintegrating powers of God are supposed to be manifest in the personality of Lord Dattatreya. 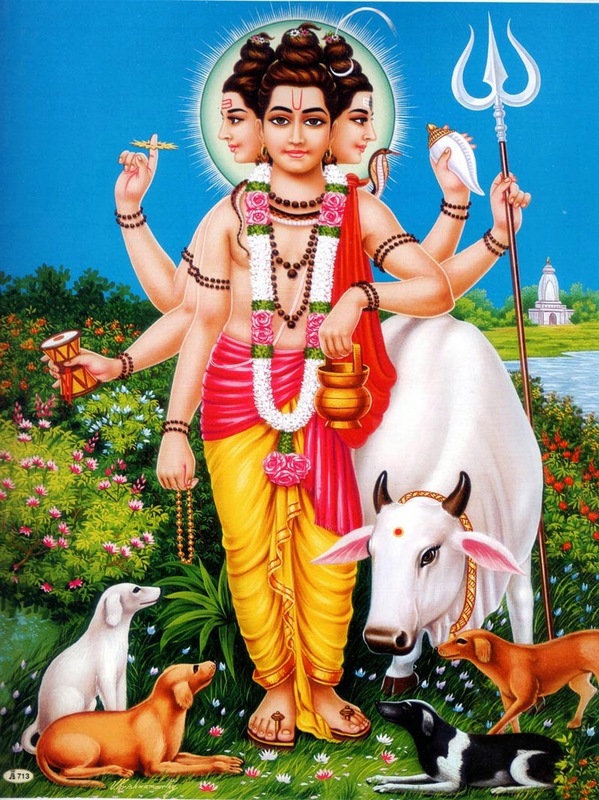 The name or word ‘Dattatreya’ is constituted of two terms, ‘Datta’ and ‘Atreya’. In Sanskrit, ‘Datta’ means one who is bestowed as a gift, and ‘Atreya’ is an honorific which is derived from the name of a great sage called Atri. The son of Atri is Atreya. A descendent of Atri also is Atreya. One who is bestowed as a divine child on the great sage Atri, by the Gods Brahma, Vishnu and Shiva themselves, is Dattatreya. Sage Narad praised Anusuya’s “pativratyam” (Devotion to her husband) a lot before the wives of Brahma-Vishnu-Shiva making them jealous of her. They requested their husbands to reduce her pativratyam. Brahma, Vishnu and Shiva went to Anusuya as guests when Atri was not there at home and asked her to serve them food (lunch). When she agreed to do so, they said that they will accept her alms on the condition that she serves them without wearing clothes. Anasuya falls into a dilemma. If she comes without clothes in front of other men her pativratyam will be reduced. If she refuses then that is dishonor to the guests and they can take away all the power of Atri. Anasuya felt that the three guests who asked such a strange favour are not normal people since they are trying to place her in a tricky situation. Anasuya prayed to her husband in her mind and said that she doesn’t have any fear serving them without clothes as she is not affected by lust. Since the guests asked for alms saying “Bhavati Bhikshan Dehi” (Oh Mother! Give us some food) and indirectly called her a mother, She decided that she will consider them as her children and serve them as requested. Because of her greatness and as per her thinking by the time she came to serve food the three gods became small children and her breasts started producing milk. She then breastfed them and put them to sleep in a cradle. Atri came back afterwards and hearing the story from Anasusuya praised the three gods sleeping in the cradle. They woke up in their original form and praised Anasuya’s pativratyam and gave her a boon. Anasuya requested that these three should be born as her children–the incarnation of Shiva, Vishnu and Brahma as Durvasa, Dattareya and Chandra (meaning moon). Shri Dattatreya or Datta Guru, an incarnation who came to light the lamp of wisdom among the people. Shri Dattatreya is a splendorous form. His face radiates all wisdom and draws us away from the lures of the world. 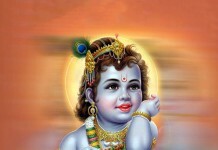 Though He is the Supreme Lord of this universe, yet He is a total and supreme recluse. Though He moves from place to place, His favorite abode is the Holy Audambar tree (A type of fig type, Ficus glomerate). He has matted hair on His head. His body is ever smeared with holy ashes and He wears tiger-skin for His garment. A cow and four dogs are always with Him as His constant companions. He is an ‘Avadhoot’, ever anchored in Spirit, but always overflowing with compassion for all the beings and the entire creation. He is the embodiment of total Godhead. All the aspects of Godhead are fully manifest in Him. His faces and form are ever radiant with peace and divine charm. The Cow, which is always with Him, represents the Mother Earth and Dharma. She is the wish fulfilling cow ‘Kamadhenu’. The ‘Sudharshana chakra’ , disc indicates that He is beyond the cycles of time i.e. the past, present and future and His holding of ‘chakra’ means He is the controller of time. The ‘bhasma’ ashes indicated His ‘Vairaagya’ dispassion as well as His purity. Ashes indicate the evanescent nature of all created nature of all created objects and the ultimate state of all matter. 17. The prostitute – Pingala: One night despite a long wait not a single client approached her. As she restlessly waited pacing up and down, hoping for a client she was finally bored and suddenly developed detachment. As long as man has desire he cannot sleep peacefully. The one who sacrifices desire is unaffected by unhappiness. Avadhut – The One who controls the eight faculties in the body of an embodied soul and shows it the path to the unmanifest dimension through the manifest dimension. 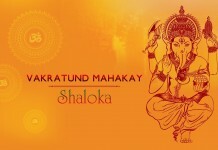 Avadhut is a medium that connects both the manifest form of Lord Datta and His unmanifest form. 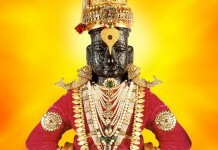 He is a manifest form (the gross manifestation) of the three principles – Brahma, Vishnu and Shiv. He is also related to the unmanifest dimension (manifestation of these three principles in the form of light). ‘Avadhut’ comes alive with the radiance of Lord Dattatreya. Digambar – Is the principle which gives company to an embodied soul till it gets Final Liberation in the radiance of the sky, i.e. beyond all the directions. Sripad – ‘Sri’ is the never-ending principle of God. The principle that takes an embodied soul to that principle of God or to the Holy Feet of ‘Sri’ principle is the Datta principle in Sripad.